The National Park Service is committed to increasing the opportunities for historic places associated with American Latino history to be documented, preserved, and interpreted and for the public to better understand and appreciate the role of Latinos in the development of the United States. The Department of the Interior initiated an American Latino Heritage Initiative in early 2011. The National Park Service’s American Latino Heritage Projects website describes some of what the National Park Service is doing to connect and amplify American Latino stories in communities across the United States. American Latinos and the Making of the United States: A Theme Study will assist government agencies and the private sector with identifying and evaluating Latino-related places for their historic significance in communities nationwide. Theme studies are research documents that help identify potential new National Historic Landmarks and potential new units of the National Park System, all of which must be of national significance. The theme study also assists in identifying historic properties of state and local significance for listing in the National Register of Historic Places. The Secretary of the Interior continues to designate new National Historic Landmarks that broaden the telling of the Latino heritage story. The National Park Service is supporting the preparation and consideration of additional nominations with the help of the new American Latino Theme Study. 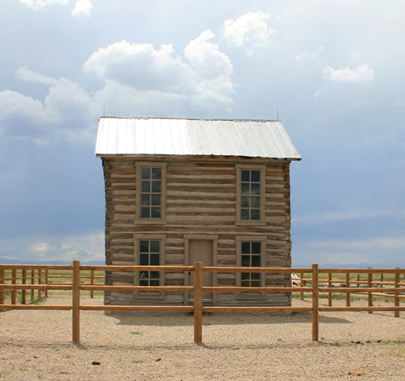 One recently designated National Historic Landmark, the Trujillo Homesteads in Colorado, provides an exceptional representation of the expansion of Hispano-American settlement into the American Southwest following the 1848 Treaty of Guadalupe-Hidalgo and an illustration of the conflict between cattle ranchers, who were primarily Anglo-Americans, and sheepherders, who were mostly Hispano-Americans. Through archeology, the site has a high potential to yield information addressing nationally significant research questions about ethnicity and race on the western frontier. The National Park Service’s Historic American Buildings Survey is documenting another recent National Historic Landmark with measured drawings, a written historical document, and large format photography. Demonstrating the significance of American Latinos in the 20th century, Forty Acres in California became the headquarters for the United Farm Workers of America (UFW) in 1966, the first permanent agricultural labor union in the United States. Forty Acres is nationally significant for its role in the farm worker movement and for its close association with the influential career of Césario Estrada Chávez (César Chávez). Many sites outside of the National Park System tell stories that reflect and illustrate the themes related to the Latino heritage. Among them are San Pascual, a battlesite of the Mexican War near San Diego, California, that is forever linked with the story told at Palo Alto National Battlefield near Brownsville, Texas, which was the first battle of the Mexican War. Through the theme study and by working with States, Federal agencies, and American Indian tribes, the National Park Service is encouraging the nomination and listing of more Latino heritage sites in the National Register such as Casa Amadeo, the oldest Latin music store in New York, which played a significant role in the Puerto Rican migration experience. The National Park Service is asking people to look for places of Latino heritage in their communities and elsewhere and to send the name of each significant place, its location, and a few sentences about why it tells an important story via e-mail to American_Latino_Heritage@nps.gov. Over 300 years of Spanish and Mexican influence shaped the cultural landscape of the Northern Rio Grande National Heritage Area in New Mexico. From its earliest Spanish conquistadors to 19th century Hispano-American sheepherders, the Northern Rio Grande Heritage Area preserves and coordinates the rich history of Santa Fe, Rio Arriba, and Taos counties. Within National Park Service areas, the American Latino experience is evident and the National Park Service is committed to telling Latino heritage stories. At Brown v. The Board of Education of Topeka (1954), for example, threads of court cases leading to the Brown Decision include Latino efforts in their struggle for civil rights. The California case, Mendez v. Westminister (1947), set a precedent in attacking Plessy v. Ferguson (1896) and the separate but equal doctrine that supported open discrimination practices in America's institutions. Following the Treaty of Guadalupe Hidalgo (1848), which ended the Mexican War of 1846, a great number of cases demonstrated how Hispanics in the territories sought to affirm their civil rights and land grant issues through the courts. Many of their arguments, some of which reached the Supreme Court, were based on first, fourth, and fourteenth amendment rights. At Jefferson National Expansion Memorial, which is largely dedicated to interpreting westward expansion, the Latino heritage experience runs a lengthy course through the history of Spain and the United States. The Latino heritage is intertwined with the Louisiana Purchase Treaty of 1803, the Lewis and Clark Expedition, 1806-07, and the U.S. westward movement. While the 19th and 20th centuries are still being explored for possible new National Historic Landmark and National Register nominations and National Parks, two sites in the National Park Service System reflect the broad spectrum of our national historic patrimony. 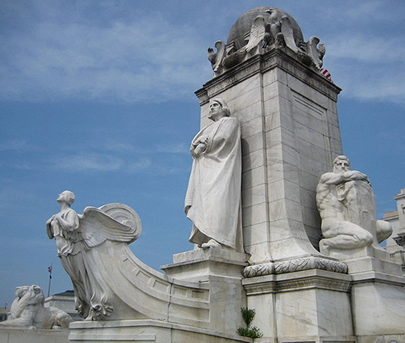 The first is the Columbus Memorial Fountain in Washington, D.C. sculpted by Lorado Taft and dedicated in 1912. It features a globe atop a shaft, with figures representing the old and new worlds, with a statue of Christopher Columbus set on the prow of a ship with a winged figurehead symbolizing discovery. The second is Chamizal National Memorial in El Paso, Texas, which commemorates the Chamizal Treaty of 1963 and the peaceful resolution to a century-long border dispute. At Chamizal Memorial, Hispanic culture is celebrated through such activities as "Siglo de Oro" and "Zarzuela" programs with participants from the United States, Spain, and all of Latin America. These two areas are symbolic of the National Park Service's determination to commemorate Latino heritage as part of the national story of the United States of America and its rich historical patrimony that began with Christopher Columbus' first voyage. The National Historic Landmark designation of Forty Acres, César Chávez' headquarters for his fight for equal rights for migrant workers, reflects the commitment to tell the breadth of the Latino story. It is a truism that much of our national story abounds with historical events and places tied to the American Latino heritage.